Today, we are thriving in a digitally advanced world where most of the communication takes place via the Internet. Instead of visiting your office in person, prospects search you on the web to know more about your offerings. Therefore, having a website for your B2B Company is equally as important as having the right strategy in place. Unable to show up on the search results with an engaging and informative site is likely to draw away customers. Define a Core Marketing Message : Why are you in Business? Optimize your website for conversions, effectively guiding customers to contact you via a prominent phone number, Web form and Live chat. 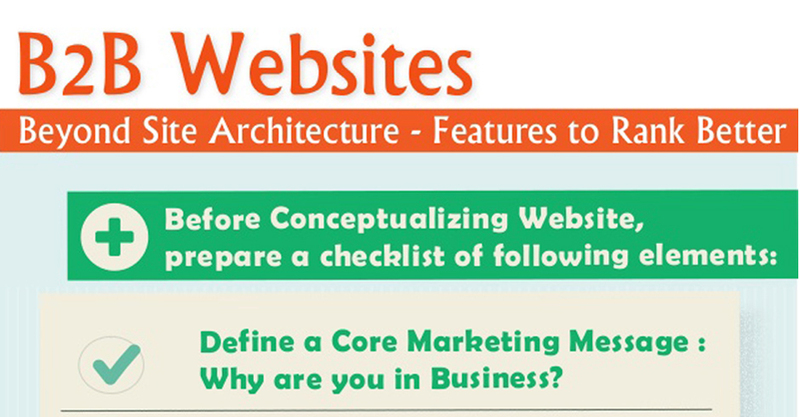 66% of small business websites lack a form-fill option to request info . Link to your social media pages from your website. Sites like Facebook, Twitter and LinkedIn help customers get the information needed to buy. Use engaging videos to build credibility and attract visitors who don’ t want to read a lot about your services and successes. 85% of people watch a video about a product on interest for at least Iminute. Remove data design elements that portray your business as old. Modern, simple design beats outdated or overwhelming elements such as garish color combinations, type in all caps, and blinking or swirling of text. Make your page user-friendly. A load time longer than two seconds, broken links, Flash-based pages, and difficult navigation drive customers away.